The Union Home Ministry of Human Resource Development (MHRD) is working on a plan to give complete autonomy to some of the country’s prestigious colleges. The move will free the colleges from the administrative control of the Universities they’re currently affiliated to. So here’s how this dramatic step promises to topple the world of the various colleges being spoken of and what the implication of this fancy jargon will be, on us students. Lady Shri Ram College for Women (LSR), Sri Ram College of Commerce (SRCC) and St Stephen’s College – three of the top ranking colleges of Delhi University are being sought to be brought under the ambit of this drastic step. However in what ensued, was a collective and outright state of condemnation and panic by the faculty and the students alike. Earlier in the year, the staff association of LSR resolved “to reject any move to delink Lady Shri Ram College from the Delhi University in any manner and in any aspect in part or in whole “. As far as LSR is concerned, clarified Ms. Meenakshi Gopinath, no such application form for autonomy had been filled or no such proposal was lying in the pipeline. This statement came in the wake of similar rumours about granting of autonomous status to these colleges. The statement also went onto say that privatisation of these colleges would compromise on inclusiveness, equity and quality of higher education in India. Calling it as one of the ways for the state to recede from the key sectors of the economy, they were completely opposed to such balkanisation of The University. The teaching community has mixed reactions to offer on this, as do a lot of DU students. Some of them see it as the last stone to be unturned for saving the fate of thousands of students from the shackles of the Four Year Undergraduate Programme being introduced in the University. 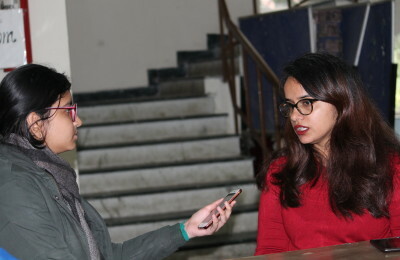 The rest of them are grappling with the fear of a possible financial crunch which might lead to a hike and a change in the fee structure in future, making higher education inaccessible to the masses. Whatever be the case, all we can do is to keep our hopes high and believe that this is not going to be another one of the rushed-and-then-put-under-the-carpet-steps blindly taken by the authorities like The Four Year Programme. While making such decisions, it becomes important to involve the stakeholders- faculty and the students and to uphold the democratic values that we so vehemently preach in the confines of those four walled classrooms. Tanya Kak is a second year student studying Political science Honors at Lady shri Ram college for Women. She generally tends to avoid all the "about me" questions but after repeated reminders if there is still something she'd like to share, it's the fact that she breathes/lives tennis and Roger Federer is a personal favorite. She is a passionate foodie and IS deeply interested in World politics.